As you well know, sharing is caring and this is what this update is all about. So what are you waiting for? The update is not available for me in the App Store. I am still running version 2.2.0 with no way of getting 2.2.1. I have reloaded the app many times, restarted my IPhone, and even deleted the app entirely. I have also had constant connection issues since first downloading the game. I would be thankful for any advice or a way to fix this. I love the game & hope to continue. Thanks! The update will be available for iOS soon. As you may know, it is very difficult to have the update at the same time for both Android and iOS because the processes are different. 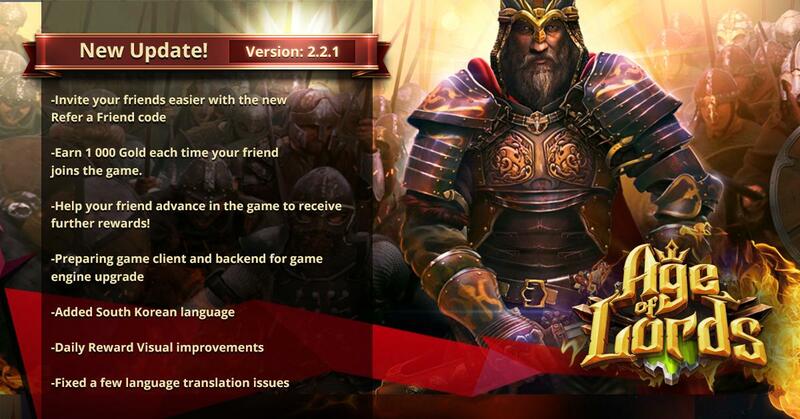 However, you should be able to update your game to Version 2.2.1 in the next couple of days. It's been more than two weeks since version 2.2.1 was released for Android. When will this version be released for iOS users? This is unacceptable! Sorry for the late reply! As you can see the update is already available for iOS too. how can I download age of lords on my laptop? is it available?